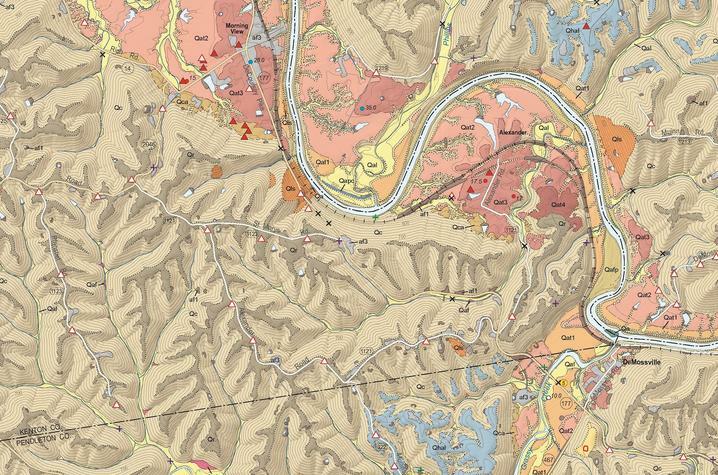 LEXINGTON, Ky. (May 7, 2018) — Geologic mapping has come a long way since the first geologic maps were made two centuries ago. Today, the use of technology and digital apps has modernized traditional mapping methods. As modern tools and techniques continue to develop, geologic mappers have to stay up to date. For more than two decades, mappers and others interested in mapping have gathered at the annual Digital Mapping Techniques (DMT) conference, typically hosted by state geological surveys. This year, the 22nd DMT is scheduled for May 20–23 on the University of Kentucky campus. The Kentucky Geological Survey (KGS), a research department at UK, is coordinating the meeting. William Andrews, head of the KGS Geologic Mapping Section, expects about 100 geoscientists, cartographers and GIS professionals to attend. Conference topics will involve all aspects of modern mapping work, from field collection of geologic information, to managing and compiling it, to eventual presentation of useful and attractive maps online. Workshop sessions will be held Monday and Tuesday, May 21–22, at the Don & Cathy Jacobs Science Building on the UK campus. Details about the meeting and registration are available at the meeting’s website. Convenient lodging and parking will also be available on the campus. KGS staff are planning additional activities for participants in the workshop. On Sunday, May 20, a daylong workshop will be offered on implementation of the Geologic Map Schema, a proposed national data structure for geologic map information. KGS will also host a “digital open house” that Monday evening at its facilities in the nearby Mining and Mineral Resources Building. Survey staff will talk about their digital field-data collection methods, the multiple capabilities of the KGS online map service and how KGS is using new mapping technologies, such as LiDAR.